Rat and Rabbit and Lurcherwork. Lamping for Rabbit. Paul and Lee Wayman out lamping with Pauls lurcher Bittern. Lee carries an air rifle. Near junction 18 of the M1, Warwickshire. Paul is a typical lurcherman who has been hunting rabbits since a child, first with ferrets, then with whippets, and now with a lurcher, and describes them as "having so much stamina, all the best breeds mingled together to make the ultimate hunting machine." He usually manages to go out lamping two or three nights a week depending on the weather. The best night he has ever had was when"the father of my present dog caught and retrieved 23 rabbits in one three hour session." More often than not, he will take home about ten rabbits after a night out lamping. As with ratting, there is an element of pest control, his job is to keep the rabbits down for the farmer whose land he has permission to hunt over, but itÕs the pleasure he gets in seeing his dog Bittern (a bedlington terrier, whippet, collie, greyhound second cross) work, that keeps him out hunting in the middle of the night. 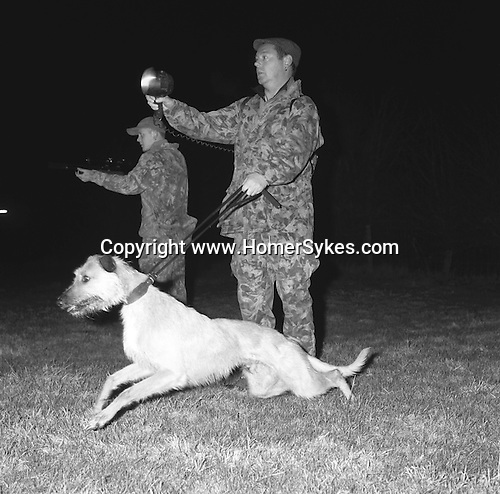 ..Hunting with Hounds / Mansion Editions (isbn 0-9542233-1-4) copyright Homer Sykes. +44 (0) 20-8542-7083. < www.mansioneditions.com >..